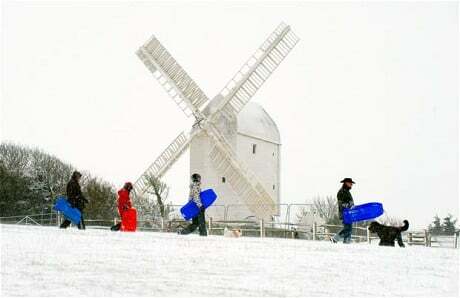 Great Britain endured its coldest Christmas day on record today. With temperatures of well below freezing expected across the country, brisk walks after filling Christmas dinners are likely to morph into somnolent crashes in front of the TV. Last night, the Met Office warned the return of freezing conditions would see temperatures dropping to as low as -12˚C, especially in regions stretching from the Midlands to the north of Scotland. By Boxing Day, snowfalls will return, and are expected to be heavy in the central and upper regions, causing major problems for those returning home after visiting friends and family in the Midlands, northern England and Scotland. The snow will continue over Monday and head to the south east, ending Tuesday morning. To add to the misery, rail and London Underground strikes are going ahead, with Tube workers striking tomorrow and two train companies, Northern Rail and Arriva Wales also on strike. Weathermen say of the cold snap continues until the den of the month, this December will have been the chilliest since 1890. The temperature of water going to homes from reservoirs in the Thames Valley and London has also dipped to a record low this December.